In the “old” days of book publishing, there was really only one way to get a book published to reach large audiences. 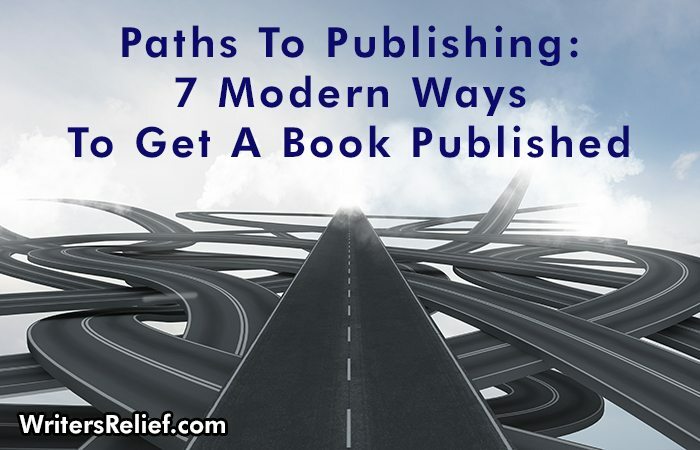 But now, there are so many paths to publishing a book that the choices can be dizzying. Here’s an overview of your book publishing options! Route #1: Get a literary agent. To get a book published by a traditional publisher (sometimes called a legacy publisher), authors should start by trying to connect with a literary agent. Traditional book publishers of novels and adult nonfiction rarely consider manuscripts that are not represented by literary agencies. Advantages: up-front monetary advances, the ability to focus on writing instead of publishing/marketing, some marketing support. Disadvantages: lack of flexibility and loss of control over your book and marketing/packaging. Route #2: Enter a contest. Many independent (aka, small) publishers host contests to find their next book. You can check out our subscription-based Writers Classifieds to find a great list of indie publishers who are looking for manuscripts. Advantages: open to experimental books or books of alternative lengths, lots of street cred for reputation-building. Disadvantages: It costs money to enter most contests, and there’s no guarantee you’ll win. Route #3: Submit on your own. Though big publishers might not be willing to consider manuscripts that are unrepresented by literary agencies, many small presses and universities are open to unsolicited submissions directly from authors. Advantages: flexibility and control. Disadvantages: contract negotiations without an agent can be tricky, and emphasis is often on literary work. Route #1: Build an empire from the ground up. Some independent-minded authors self-publish to maintain control over every aspect of the publishing process, from engaging proofreaders to finding cover art designers to connecting with book distributors. Advantages: complete control and bigger royalties than traditional publishing. Disadvantages: More time spent on administrative tasks and marketing means you have less time for writing. Route #2: Contract with a self-publishing company. Many writers self-publish by enlisting the service of a self-publishing company. These companies manage the publishing process—from formatting to uploading to printing—doing as much or as little as an author requires. Advantages: Save time by getting help. Disadvantages: You have to watch out for hard-sell, unscrupulous self-publishing companies. If you want to self-publish but are nervous about going it alone, Self-Publishing Relief can help you navigate every step of the process, from formatting your manuscript to a professionally finished book you can be proud to put your name on. Route #3: Self-publish with the indie imprint of your target traditional book publisher, and hope to get noticed. Some major publishers have established secondary imprints that allow writers to self-publish using their services. The major benefit is that if your book starts to do well, you might find yourself offered a nice book deal from the parent company. Advantages: networking, getting noticed in your genre. Disadvantages: getting lost in the crowd. Become a hybrid author—a writer who publishes both traditionally and independently. A hybrid author may have regular book deals with major publishers, but might also independently publish his or her smaller novellas or might self-publish in another genre under a different pen name. Some hybrid authors—those who are selling exceptionally well—work with traditional publishers for their print rights but hang on to the rights to their digital sales. Big book publishers, which haven’t historically been known for their flexibility and willingness to compromise, are beginning to see more and more value in embracing hybrid authors. Question: Which of these would you recommend to other authors?